Surfing in the Philippines is steadily growing in popularity, as the country is gaining recognition as one of the best surfing destinations in Asia. Not many locations can compare with the Philippines’ wealth of available adventures and sheer number of islands to explore. There are plenty of beaches in all areas, ensuring you can easily mix in some surfing to your vacation plan. Alternatively, you could also build the ultimate surfing vacation, revolving entirely around surfing. Our services include pre-made packages and tours to specific surfing spots, or a complete surfing itinerary in the Philippines – fully customizable to meet your exact expectations. Our strong local presence, combined with the fact we only work with handpicked local providers, makes us confident we’ll find the best secret surfing sites and most suitable resorts. Read below for more information about surfing in the Philippines, as well as the best destinations, tours and resorts. All of the packages above are fully customizable, so you could have the exact vacation you had in mind. Read below for more information on the locations we work in. Every location is well suited to the proficiency level and budget of the package. If you want to change any of the locations and resorts, or extend the duration, simply mention it in your inquiry form. The accommodation in the packages above are mostly surf oriented resorts. Those tend to be easy going and relaxed. However, staying in finer establishments is also possible. The tours included in each package are not related to surfing, and intended to compliment your holiday while you take a break from the waves. You can choose not to include them in your package and reduce costs, or go on the tours independently while already there. Many people who want to surf during their vacation, but want to travel to other popular destinations, often choose a shorter surfing package in one or two destinations, and ask to combine it into a larger package. For more information on our services visit our full destination catalog. With so many great locations, it’s not always easy figuring out exactly where to surf in the Philippines. It really depends whether surfing is the focal point of your vacation – which will make visiting remote surfing spots worthwhile, or you want to spice up your trip to popular tourist destinations with a little bit of surfing. You shouldn’t need to compromise at all, since some places offer an amazing surfing experience and are also well established tourist destinations. With this in mind, anyone can surf on his vacation in the Philippines, novices and experts alike. The best thing to do is to ask us what’s best for you – we will build any itinerary you had in mind, or a new fully tailor-made surfing vacation. Siargao is by far the most famous surfing destination in the Philippines, and one of the best in the world. Ranked 9th in CNN’s list of best surf spots, Siargao has been attracting surfers from all over the globe. Most famous beach is cloud 9 and that’s where most of the action takes place – but there are enough other spots where the waves aren’t as high and you can enjoy some more privacy. Getting to Siargao is simple – catch a flight from Manila or Cebu to Sayak airport directly, or to Surigao airport followed by a short ferry ride. An overnight ferry is also available from Cebu for those looking to save a few bucks. Ever since the airport was built, tourism to Siargao has risen significantly, and now it has become a vibrant location with great nightlife and a wide range of accommodation available – anything from cheap hostels to luxurious resorts. Surfing in Siargao is good all year long but the best time to visit is August to November – The typhoon winds bring big waves which can reach up to 10-12 feet (3-4m). Novices are also welcomed in Siargao, as many of the surfing sites are beginner friendly. 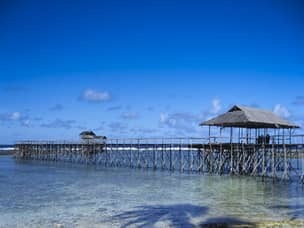 Moreover, Siargao is a great place all over and not restricted to surfers only. It offers world-class surfing and many tourist attractions, making it very popular among locals and foreigners alike. Add Siargao to your package and we will make sure you enjoy the best hotels, tours and surfing services. We’ll also stay in touch throughout your stay to make sure everything goes according to plan. For more information, visit our guide to Siargao island, where you can read about our services in greater detail, and add each to your wishlist individually. Baler is the oldest surfing spot in the country, and is very well known among the locals. It all started in the 70’s when the shooting of Apocalypse Now partly took place in Baler. 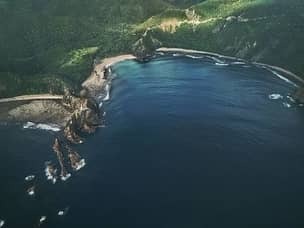 If you remember the scene where Colonel Kilgore tells his platoon ‘if I say it’s safe to surf this beach, Captain, then it is safe to surf this beach!’, it took place in Baler rather than Vietnam. After the set left, the locals practiced what they learned during the film shooting. Surfing is possible all year round, but the best season is October to February. During that time 10 feet (3m) waves are frequent in Baler, making it the best surfing spot in Luzon. Until recently accommodation in Baler was only midrange but now there is also a 4 star resort there. In general, Baler became more accommodating to international travelers, and there are many lodging options there, from cabanas and cottages for renting, to all-inclusive beach resorts. The surfing beaches in Baler are Sabang, Charlie’s Point, and Lindy’s Point. Sabang is the main sandy beach, and the break is good for beginners and intermediate surfers alike. It is also the beach where most of the resorts are situated. Charlie’s Point is where Apocalypse Now was shot, and is just a little north of Sabang. Lindy’s point is 15 minutes’ walking time from Sabang Beach, and has tall short waves that are praised by expert surfers. Cobra reef in front of Cemento take 10 minutes to get to by a small boat, and has 14 foot (4m) barrels during the high season. It is the place where the annual surfing competition of Baler takes place, and is suitable for expert and professional surfers only. There are more surfing spots in Baler, but those are the main ones. Once there, the professional staff of the establishments we work with will guide you. Though it hosts one of the oldest surfing communities in the Philippines, Baler mainly draws local surfers, because other than surfing there is not so much to do there. However, it is still one of the best surfing spots in the country, especially for those who travel on a budget. Surfing lessons and equipment rentals are cheap, which is another concern for budget travelers and large groups. Getting to Baler can be done by a private van, or by buses from Manila, leaving from Cubao, Quezon City. There are two bus companies that provide the service, Genesis Bus, and Joy Bus, from midnight to 07:30am. It is highly advised to take the night buses to avoid traffic, and to endure the 6 hour drive at night, not wasting your time. Book you Baler Package with us for the best resorts and most convenient transportation, and have a carefree vacation. Only 5 hours from Manila, with some of the most affordable and best surfing schools, San Juan in La Union is one of the surfing meccas of the Philippines. The main beach in San Juan has 3 breaks alone. The beachfront has many hostels, resorts, restaurants and shops making it a very convenient spot for a short surfing vacation. Inquire now for a surfing package in La Union. The best season for experts is from October to the end of February, with waves up to 10 feet (3 meters) tall. March to June is suitable for beginners with much calmer waves. Besides of San Juan there are other beaches in La Union worth surfing at: Mona Liza Point, the Bowl, and Bacnotan. 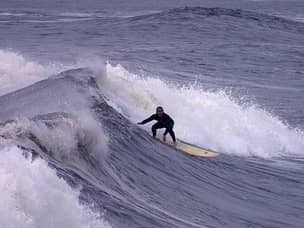 Mona Liza isn’t recommended for novices, because the swell breaks on a sharp and shallow reef, and it will take some expert maneuvers to surf there safely. The Bowl is in front of Kahuna Beach Resort, and has small barrels and steep drops. It’s therefore better for people with some skills under their belt. Tuboc and Bacnotan are 30 minutes’ drive north of San Juan. These 2 beaches are known for their long fun rides, and for sandy breaks. It makes a great spot to visit with a group of friends, beginners and experts alike, and then the traveling expenses can be shared between everyone. Getting to La Union is easy both from Manila or Baguio (if you’re transferring there). Renting a private van is always faster and more convenient, but taking a bus from Manila is also a valid option, taking 5-7 hours. Genesis and Partas Bus has terminals in Pasay and Cubao, with buses leaving every hour except 2-4 AM. If you’re traveling during daytime, it’s better to avoid the traffic and catch a bus from Sampaloc or Quezon City, and cut around two hours from the total traveling time. Farinas Transit Company leaves from Sampaloc, and Viron leaves from Cubao almost hourly. From Baguio there are three bus companies that are La Union bound: Partas, Philippine Rabbit Business Lines, and Mini Bus Lines. Travel time is 1-2 hours. Pagudpud is one of the best places when it comes to surfing in Luzon. It’s still regarded as an off the beaten path destination but enjoys a growing popularity. Pagudpud is a beautiful tourist destination, suitable for all kinds of travelers, not only surfers. It’s often nicknamed the Boracay of the north because of its beautiful white beach. Much like Baler it is more economic than other major tourist spots, but is more difficult to get to. For a comprehensive overview of Pagudupud, how to get there, and more attractions that Ilocos Province has to offer, visit our designated Ilocos guide. There, we offer the best accommodation, tours, deals and transportation available for Pagudpud, including surfing packages. The surfing season in Pagudpud is between July and September, when the waves become much larger and stronger. In general the waves are considered strong, and therefore it’s regarded as an experts’ surfing destination. 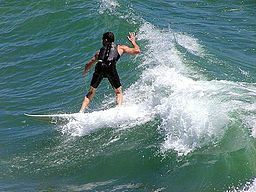 Although it is possible for beginners to experience some surfing too as there are beaches with a less powerful waves. November to March is the windy season of the province, and the windsurfing and kiteboarding season in Pagudpud. It’s available in several beaches, including Blue Lagoon, Bngui Beach (near the windmills), and the secluded Kingfisher Beach. Pagudpud is suitable for advanced kiteboarders because of the tall waves. We recommend Pagudpud for those who love to get away from the crowds, and are not focused solely on surfing, because of the many attractions and great beauty of the area. What if you’re not surfing oriented, but want to spike your vacation with some new experiences. Or you are into surfing but don’t want it to be the guideline of you vacation in the Philippines. We strongly believe that Siargao that we presented above is a destination that provides both surfing and popular touristy experiences. In most other major tourist spots in the Philippines, board surfing isn’t available. The calm waters that is perfect for diving, doesn’t go hand in hand with it surfing. However, when it comes to kitesurfing there are many prime destinations that offer the best kiteboarding in the country. In that way you can enjoy a vacation without compromising on the location, and enjoy one of the most fun watersports. All destinations we recommend have top of the line equipment and instruction. Kiteboarding season in the Philippines is the Amihan season, November to March. 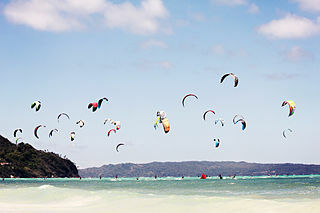 Boracay is regarded as one of the best kiteboarding destinations in the Philippines. Bulabog Beach has many schools to choose from, that also rent windsurfing equipment. It is by far the most convenient place to experience kiteboarding and windsurfing. It is central, has great infrastructure when it comes to surfing and accommodation, one of the best beaches in the country, and it has the best nightlife in the Philippines. Here you can find a detailed guide of Boracay, and see if you want to include kiteboarding in your Boracay package. Palawan has also some of the Philippines best kiteboarding beaches. Coron and Puerto Princesa are the best places, and El Nido comes third. Cuyo Island is part of Palawan, but you can read about it in the ‘hidden gems’ section below. Coron and the Calamianes Islands are also among the top in the Philippines. There are kiteboarding clubs in Coron Town, and one on Bamboo Island, a private island 1 hour away from Coron with an eco-resort and good facilities. Expect the most beautiful views while kitesurfing in Coron. No big waves around here, expect flat water and open water chops. Puerto Princesa enjoys the same conditions, but not as many beaches you can kiteboard in. Kiteboarding is also possible in El Nido, although it’s not one of the best destinations in the Philippines. Yet from November to March there are consistent winds that makes kitesurfing there enjoyable. The flat water is also a key element why this place is perfect for beginners, as it makes it a lot easier to learn this new skill. Getting to Qi Kiteboarding Resort from El Nido Town takes 1 hour. El Nido is one of the few destinations that are both highly popular, and allows board surfing. Duli Beach is just 30 minutes away from El Nido town, and has a resort where you can stay overnight, or use their facilities, and rent boards. The surfing season in Duli Beach is from November to April, with a consistent swell and waves perfect for beginners and fun rides. Add surfing in Duli to your Palawan vacation, and maximize your experience there. If you feel that La Union is too far away, and really plan on a quick getaway. The beaches of Zambales are a little closer, and offer really good waves too. The beach towns that have consistent swell and good breaks, as well as equipment rentals are San Antonio, San Felipe, and San Narciso. The later is the most popular and has nicer resorts. Surfing is good all year round, when May to November is the most consistent, with less powerful waves, and perfect for all levels. December to April is less consistent, but the waves can become huge (4 meters), so It’s only good for experts. The best beaches are seasonal, and the staff from your chosen resort will guide you. One spot which isn’t on the mainland is Capones Island, accessible from Pundaquit by banka (a small boat). It has a number of breaks that unlike Zambales are all reef breaks, with bigger and faster waves on the season. As with all reef breaks it takes experience and caution to surf there. Getting to Zambales from Manila is easy, and takes 3-4 hours, depending on traffic and your departure point in Manila. Victory Liner has 4 bus terminals in the following locations: Pasay City, Cubao, Caloocan and Sampaloc. The terminal in Cubao is the most consistent one, and leaving from Sampaloc will save you time (but buses from Sampaloc leave until 18:00). Visit our Manila guide for more information on how to combine surfing in Zambales with the rest of your vacation. As a country of more than 7,000 islands it is quite obvious that there will be so many uncharted surfing beaches. Some are known only to locals and those who are in the know. Here are some remarkable surfing spots for the adventurous travelers, who are willing to endure a long complicated journey to reach their ultimate place. Bicol Region has some of the country’s best beaches when it comes to surfing. The most northern (and closer to Manila) is Bagasbas in Daet, then Catanduanes close to Caramoan, and Sorsogon. Tough Bagasbas is highly popular among locals, it is a beginners spot with nothing really special in it. If you are tired from going to Zambales, or want an easy start before heading to more advanced spots, you can try Bagasbas. Catanduanes, and Gubat in Sorsogon are a different story. Puraran in Catanduanes, just like Siargao, has huge waves, barrels, and pure white beaches. Gubat in Sorsogon is a little mellower and offers great surfing for novices, and not less beautiful than Puraran. If you want surf in these untrodden beaches, inquire now about a custom surfing package. Eastern Samar has very similar traits as the formers in Bicol, and is accessible from Cebu. It’s also a place for the adventurous surfer, and it’s better to tour there at your own pace. The high season in this part of the Philippines is October to march. For one of the best kiteboarding destinations in the Philippines, Cuyo Island which is technically in Palawan, takes 13 hour to get there from Puerto Princesa by ferry. There is a ferry everyday but Mondays with a changing schedule. There are flights from Puerto Princesa 4 time a week in a 9 seater Cessna by Air Juan. Cuyo is great for those who like to travel to the most remote places, and willing to sacrifice convenience for authenticity. It is also extremely beautiful yet affordable. Contact us for an unforgettable vacation package in Cuyo Island. If you just recently got into surfing the Philippines is a great place to hone your skills. There is no shortage of surf spots which are great for novice surfers – the waves are relatively mellow and services are very well tuned to cater to beginner’s needs. All destinations featured on this page include resorts which focus on visitors who wish to surf. We are certain picking the right place to stay will take care of everything – you will be able to get personal lessons and meet a ton of other cool people you can surf with. Lessons take about 2 hours, and after just two you should already be able surf on your own. Most of these surf camps also offer all necessary equipment, or at least include an in-house surf shop. Those who are interested in joining a surfing group, should check our group tours offers – it’s a great opportunity to meet like-minded people and travel together. Out of all available destinations we especially recommend Siargao and La Union. Siargao is adapted to cater to every type of surfer – it won’t be a problem finding good surf camps, make new friends and find peaceful beaches to practice in. La Union on the other hand, is much quieter although just 5 hours’ drive from Manila. It is one of the best surfing spots in the country, full of affordable surfing schools and resorts. For beginners, its best to contact one of our experts for free advice. We will help you build your entire trip in a sensible way and make sure you find the best accommodation. Alternatively, you can just add any of our recommended locations to your cart and build your own custom surfing package. We will later help you adjust it to make sure you enjoy the best deals and services available. As mentioned, most places allow for great surfing throughout the entire year. The surfing season lasts between August and January – that’s when typhoon winds start creating really big waves. However, it does vary between locations – so the best solution is to read our reviews carefully and plan ahead. Water temperature stays at about 27°C (80.6°F) but the weather can be tricky, especially during the monsoon season. Rainfalls and floods can make surfing too dangerous, or even prevent you from reaching your destination altogether. You should keep a close eye over the official weather report, as well as the various weather forecast sites and apps. Since we keep a close relationship with all local establishments, we can always keep track of the weather for you and get some first-hand opinion whether it’s suitable for surfing or not. In case your plan must change due to unexpected weather, we promise to help you re-organize your trip. We’ll do so in a way that minimizes your expenses, and still allow you to enjoy a great vacation. By choosing any of our services, you will make the most out of your vacation and save money doing so. With the help of our experts you will be able to find the best resorts and coolest beaches. We will help you plan your trip while taking all dynamic factors in mind : weather, budget and transportation – and make sure your package is designed correctly to allow you to have the best time of your life. Let our team of experts offer their free advice and help plan your entire surfing package, or add a surfing element to your dream Philippines vacation. It will guarantee you don’t waste time in lousy resorts and go to the wrong destinations. We promise you’ll get to enjoy the perfect holiday without having to worry about a thing. Are there spot to surf in cebu? Not really in Cebu itself, but the island serves as a hub to many different locations. Your best bet is to take a flight (or ferry) to Siargao, while in Cebu i would focus on other cool activities that are better done there like diving and canyoneering for example.